Enjoy convenience and value at this comfortable hotel near St. John's University and Queens College. Whether you are in town for a baseball game at Citi Field, or a lecture at one of the universities, thoughtful touches such as free parking, free continental breakfast and friendly service make all the difference. Relax in comfortable rooms and suites equipped with coffeemakers, microwaves, refrigerators and cable or satellite TV. 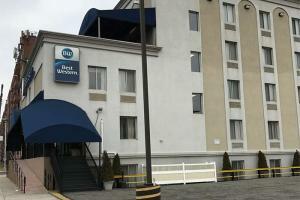 The hotel well located to both JFK and LaGuardia airports, and Manhattan is just a short train ride away. Located approximately 4.5 miles from John F. Kennedy International Airport and 6 miles from the La Guardia Airport. Jamaica Station is about a 15-minute walk from the hotel.